The Amish Fort Mill Dining Chair brings the solid wood beauty of Amish furniture to your dining room collection. These beautiful dining chairs make an impression with solid woodworking that is sure to impress. 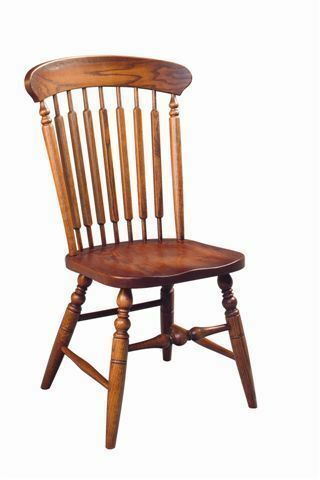 The chair backs consist of seven paddle-back spindles that display the sophistication and premium quality of Amish craftsmanship. These versatile dining room chairs are built the Amish way, with a durability and strength that will keep them in your family for many years. Available in distinguished cherry wood or warm oak, a collection of side and arm chairs will illuminate your dining room decor with comfort and style. Take a look at our helpful blog post, "DutchCrafters Ultimate Guide to Choosing the Perfect Dining Room Chair," for helpful tips on chair styles and measurements. Our Amish Coronet 24" Barstool brings this style to your pub table or kitchen bar area. Call one of our Amish Furniture Specialists today, toll-free at 866-272-6773 with any questions. We are happy to help.